NEW DELHI: Russia has conferred its highest civilian honour, The Order of Saint Andrew The Apostle, upon Indian Prime Minister Narendra Modi for promoting strategic partnership between India and Russia. "On April 12, Narendra Modi was decorated with the Order of St Andrew the Apostle for exceptional services in promoting special & privileged strategic partnership between Russia and India, and friendly relations between the Russian and Indian peoples," the Russian embassy in India said in a tweet. The Ministry of External Affairs has said, "India greatly appreciates this honour bestowed upon the Prime Minister by the President of the Russian federation. The award signifies the special and enduring strategic partnership between India and Russia marked by exceptional warmth and friendship extending to our peoples." 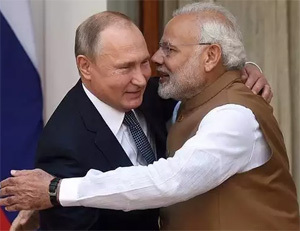 Both Modi and Russian President Vladimir Putin, on whose behalf the award has been announced, have had a series of meetings in the last five years of Modi's tenure as Prime Minister of India. “President Putin remains a source of great strength for the India-Russia friendship. Under his visionary leadership, bilateral and multilateral cooperation between our nations has scaled new heights,” he added. The award is given to prominent statesmen and public figures and representatives of science, culture, the arts and various industries for their exceptional services in promoting the prosperity, greatness and glory of Russia. 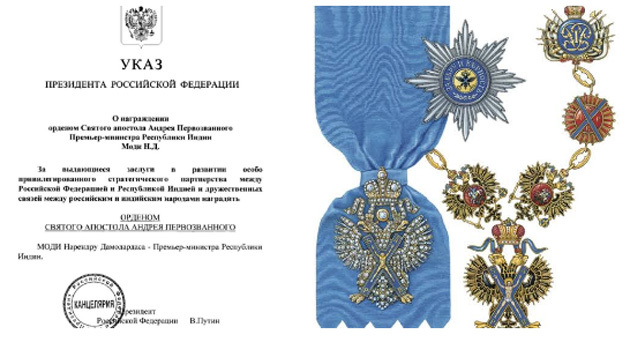 The order can also be awarded to foreign heads of state for outstanding services to Russia. Foreign recipients included President of China Xi Jinping, President of the Republic of Kazakhstan Nursultan Nazarbayev and President of the Republic of Azerbaijan Geydar Aliev. The Order was established in 1698 by Tsar Peter the Great, in honour of Saint Andrew, the first apostle of Jesus and patron saint of Russia. The award is presented at the St Andrew Hall of the Grand Kremlin Palace. In the past five years, Modi has got seven global awards - from the United Nations, South Korea, Saudi Arabia, Palestine, Afghanistan, United Arab Emirates (UAE) and Russia. It was only a week ago, the UAE awarded the country's highest civilian honour, Zayed Medal, to Modi for his significant role in strengthening the relationship between the two countries. Modi, on a brief visit to Afghanistan, was conferred with Amir Amanullah Khan Award, the country's highest civilian honour, in 2016. He was awarded the honour by Afghan President Ashraf Ghani.